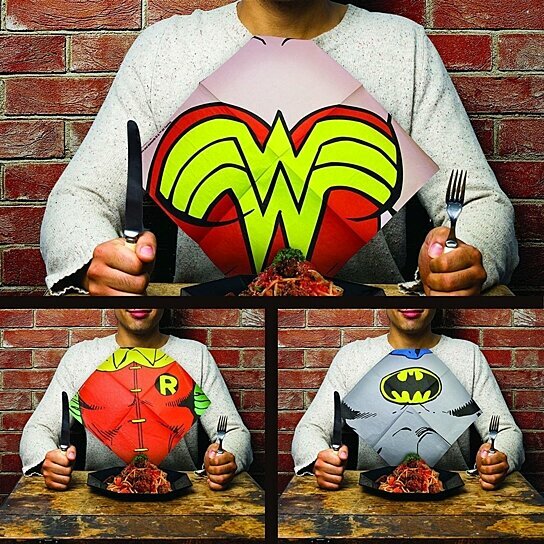 Easy clean up: perfect for that sloppy eater or for your messiest foods, these dinner napkins have a breast plate design to tuck into your shirt and feature an iconic DC Comics superhero. Perfect for any Batman or Superman fan: whether it’s for a messy eater or a superhero fan, these DC Comics dress up napkins are sure to save the day and the shirt no matter the mayhem! Any occasion: whether it’s for a dinner party, picnic, tailgating, birthday party, or just a meal at home, these DC Comics dress up napkins are sure to make it a Super dining experience! Contents: contains 24 dinner napkins, featuring 4 different designs with iconic superhero characters Superman and Wonder Woman, plus crime fighting duo Batman and Robin (6 napkins of each hero). Officially licensed: save the day and your shirt! Superman, Wonder Woman, Batman and Robin are all joining you for dinner this evening! this is an officially licensed DC product.